One of the greatest hits from soul singer John Legend's fourth studio album Love in the Future is the song All of Me. The song was first released as the third single from the album on August 12, 2013. It was a huge hit. As of this writing, the official video for the song on YouTube garnered nearly 200 million views. Not surprisingly, dozens of artists covered the popular song with their own versions of it. 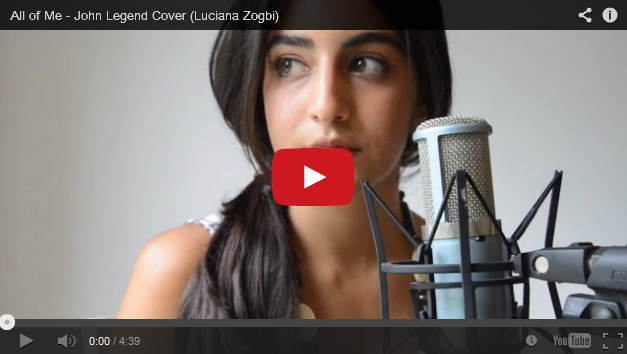 When it comes to female cover versions of the song, nothing tops the one by Brazilian-Lebanese artist Luciana Zogbi. The beautiful girl posted her cover on YouTube and so far it was able to amass over 8 million views. For more of Zogbi's cover versions of popular songs, check out her YouTube account. She has covered The Scientist by Coldplay, Addicted to You by Avicii, Stay With Me by Sam Smith and Broken Strings by James Morrison. All of Me is a track from John Legend's album Love in the Future. It was released in 2013 and it's the artist's fourth studio album. His first three albums were Get Lifted, Once Again, and Evolver. Some of his greatest hits include Ordinary People, So High, Save Room, Heaven, Show Me, Everybody Knows and If You're Out There. Here's the original by John Legend.